One of our most popular Bites of the Week was the Weight Watchers Giant Latte Bars, featured in February of this year. 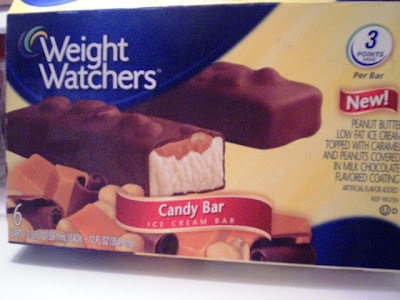 I received a lot of feedback on that bar and various other Weight Watchers ice cream products. Since then, Mom and I have tried several of their frozen treats, but were very excited when we spotted a new one - an ice cream candy bar. "The best of both worlds," we exclaimed. We couldn't wait to try it. THE VERDICT: Excellent! The portion was actually a good size, which is usually not expected from a "diet" product. Speaking of diets, if you're following the Weight Watchers plan, this particular bar is only three points. The frozen candy bar had a great chocolate coating and a light caramel stripe, which gave the ice cream a nougat-like texture - just like biting into a real candy bar. The added peanuts helped to bring out the flavor of the low-fat peanut butter ice cream. Honestly, these bars didn't last too long at my house. They were too delicious!